The final chapter of From Software’s beloved Dark Souls series has finally hit, bringing the obscure story to a close at last (at least until the first DLC pack hits this fall). I’m here to attempt to piece the story together for those who don’t have the time. Compared to Bloodborne, which I did similar articles for, the lore of Dark Souls III is incredibly dense, and filtering through it is going to take more than one article. So I’ll be splitting this into several parts, which, knowing me, will take absolutely forever to actually come out. For today though, I’ll be talking about the first few areas of the game, up through the Undead Settlement. Since this is about early game spoilers, prepare for early game SPOILERS. In the age of ancients, the world was formless, filled with crags, and fog, and ruled by everlasting dragons. Then fire came, and brought disparity. Gwyn led the gods to overthrow the dragons, using lightning to strip the scales of immortality from their bodies. So began the age of fire, as Gwyn and the other gods ruled from high above in their golden city of the sun, Anor Londo. It was a glorious age, full of wonders. But no age was meant to last forever. Eventually, the fire began to fade, as was natural, and the age of fire began to transition into a new age, just as power had shifted from the dragons to the gods so long ago. Without fire, a new age would begin. An age of darkness. An age of man. The Primordial Serpent Kaathe sought this age of dark, and led the kingdom of Oolacile into ruin as they turned the Primordial Human into Manus, Father of the Abyss, who caused their humanity to run wild. The legends say that Manus was defeated by the Knight Artorias, who was himself lost in doing so. Later, Kaathe also led the human city of New Londo into destruction, seducing them with the power to steal humanity, and creating the Darkwraiths. New Londo was flooded to keep the Darkwraiths in check, at least until the Chosen Undead came along. Gwyn feared the end of his age, and the gods grew desperate to stop this darkness at all costs. The Witch of Izalith warped into the Bed of Chaos when she attempted to create a new flame. Gwyn committed the first sin, when he burned himself hollow, using himself as kindling for the flame. So the age of fire was extended for a time, yet Gwyn was burned into a lord of nothing but cinders in the process. 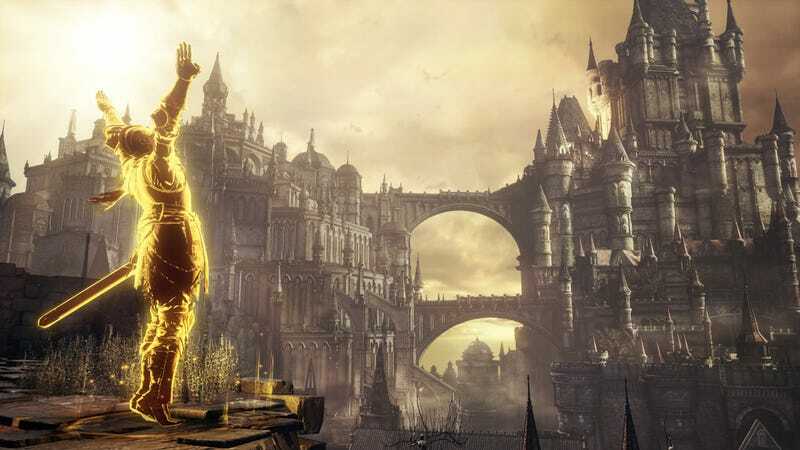 The child of Gwyn, Gwyndolin, created a false sun over Anor Londo, and through powers of illusion made it seem as though Lord Gwyn had never left. This was being done alongside another Primordial Serpent, Frampt, who was a friend to Gwyn and his kin, and sought to lead certain Chosen Undead to “succeed” his lord, leading them to link the fire. Eventually, the first flame began to grow dim once again, and a Chosen Undead went on a pilgrimage to Lordran, home of the ancient lords, only to be used as kindling to link the fire once again. This cycle repeated itself countless times. The fire fades, and a chosen undead gathers power to be used as kindling. Sometimes, the undead chooses another path, such as the King Vendrick, who used his power instead to create a great kingdom. Eventually, though, another will rise up, link the fire, and be reduced to nothing but cinders. Vendrick himself was tricked by his wife, Nashandra, the Queen of Want. Nashandra was in reality, a fragment of Manus, who had been defeated, but not truly destroyed. These fragments of darkness manifested after eons into several queens of several kingdoms, each of which was led into ruin. Elana, the Squalid Queen of the Sunken Kingdom. Nadalia, the Bride of Ash, who arrived to her Old Iron King too late, and instead led the Knight Raime, who was transfixed with her, into ruin. A different story can be told about the last queen seen in Dark Souls II, however. Alsanna, the Silent Oracle, while a fragment of pure darkness and abyss, was changed by her husband’s genuine, unconditional love. When the Old Ivory King fell to the Old Chaos, trying to protect the kingdom, she stayed loyal to him, and stayed watch over the chaos, and what remained of him and his legions, all alone in a frozen city. The cycle of light and dark repeats, over, and over, and over again. The world grows tired of it. An age of flame that was never meant to last, a fire that should have long passed burning out. The age is on its final gasps of life. The first flame is closer than it’s ever been to dying out. The link of fire is threatened, and the bell tolls. Lords of Cinder, those who have linked the flame in ages past, rise from their graves. However, the Lords did not fulfill their duties. They abandoned their thrones, and so the Unkindled rise. You, the player, are one such Unkindled, called to an important duty, in hopes that you might be able to save the age.. The first challenge you encounter is an ashen judge, the one known as Iudex Gundyr, there to stand watch over the graveyard, and challenge those who might embark on the journey the unkindled must face. This judge has become corrupted by darkness, however. When he is awoken by taking the coiled bonfire sword impaled through his chest, he soon transforms into a creature touched by the darkness, with twisting serpents of abyss spilling out of his body, and violently flailing after you. Once the judge has been bested, you are able to continue onward to Firelink Shrine. It’s a familiar name, but different from the one those who have played the first Dark Souls might know. Indeed, this shrine is huge, and takes the shape of a kiln itself. Five enormous thrones tower above the main area, four of which lie empty. The Lords of Cinder are nowhere to be seen, with one exception. The thrones have the names of their owners inscribed upon them. Yhorm, the reclusive king of the Profaned Capital. The Undead Legion of Farron, abyss watchers all. Aldrich, the Saint of the Deep. The Holy King Lothric, last of his line. These Lords go without their thrones, and only the smallest among them remains, Ludleth, of Courland. The Shrine is watched over by the Firekeeper, who is blind, as all firekeepers are required to be, lest they have visions of things most terrible. When you speak to the Firekeeper, your path is laid out before you. So too can you talk to Ludleth, the only Lord of Cinder to remain at Firelink. Looking at him, he’s anything but impressive, a frail, charred little man. Indeed, he is charred, and the throne accepts him as its own, so no matter how strange it may seem, his words appear to be the truth. Of course. The linking of the fire, once again. This world which lies in ruins, seemingly on the precipice of being undone for good, must once again be preserved through the linking of the flame. The perpetuation of the endless, exhausted cycle. This is your purpose, to keep this age from dying once again. Seek out the missing lords, and find some way to bring them back to their thrones, so that the futile nature of fire might be temporarily, meaninglessly, continued. There are others in Firelink Shrine, such as Blacksmith Andre, who players of the first game will instantly recognize, or the Shrine Handmaiden, who will help supply you on your journey, for a price. Most interestingly though is a crestfallen knight, Hawkwood, who is a fellow unkindled. These themes of failure, the phrase “unfit to be cinders,” and the idea that they constantly yearn for warmth they cannot experience (the Ashen Estus Flask’s item description says that it’s befitting of an Unkindled, as it turns a bonfire’s flame cold) seem to indicate to me that they are Chosen Undead from previous cycles who couldn’t quite make the cut, weren’t quite up to the task. This is different from those like King Vendrick, who had the ability to link the fire and chosen not to, but rather those who either couldn’t quite make it through the obstacles in their way, or who attempted to link the fire, and weren’t powerful enough to properly do so. Being adequate fuel for the flame, after all, takes incredible strength, see, for example, Gwyn and his army of Silver Knights. In any case, you set out on your journey, to the High Wall of Lothric. Time has always been convoluted in Lordran, and the world of Dark Souls. Undead of the long since past, and the yet to come converge upon the present as time overlaps itself. Lothric, though, is a land where space itself is distorted as well. Lothric was another kingdom that found itself pulled into the endless cycle, like many before it and many after. It was connected to an Undead Settlement by a high bridge, watched over by one of the Stray Demons of old, until one day a high wall simply appeared, shattering the connection between Lothric and the outside world. When this wall appeared, messengers were sent from the High Wall down to the village below, but that they had no way of returning. Lothric lies in ruin, as do all kingdoms in this world where the fire is closer to true extinction than ever before. The hollows of Lothric have begun to take strange form, some of their limbs twisted into roots, into trees. Other hollows mindlessly worship those who have changed, as though they crave this ascension themselves. Some of these hollows, however, have been overrun with the darkness that lives inside of them, and now violently explode in the same way Iudex Gundyr did. These monstrosities are known as the Pus of Man. As the fire began to fade for Lothric, the Pus of Man became an increasing threat, eventually leading to the sealing of Lothric’s Grand Archive, as a last ditch defensive effort. Lothric is also infested with Wyverns, or dragons, as they are more commonly known (not to be confused with the true eternal dragons of old, such as Kalameet, though likely related to them). Most of these dragons lie dead, as do most things in this dying world, still, some of them roam, and hunt trespassers. Knights of the high castle still roam the wall too. These Knights, and the Wyverns they are associated with, have long been known as one of the three pillars of Lothric. As the pillars, they were even permitted to rear dragons when Lothric society still existed. Lothric itself has a lot of ties to the dragons, though that is a story for much later. The other pillars of Lothric were the Priestess, the highest of which served as the prince’s wet nurse, and the Scholar. Another “pillar” of sorts, the Hunter, worked from the shadows to accomplish things the King’s official three pillars could not. These “pillars” are now long forgotten though, as it’s been a long time since Lothric was a place of majesty. Now it’s a land of hollows, ash, crazed knights, and petty thieves. The thieves dared not set foot inside Lothric Castle itself though, as the place was said to devour men. Instead, they practice One such thief still remains unhollowed, and should you find the key to the cell which he remains in, you’ll be able to talk to him. He goes by the name of Greirat, and once freed, he’ll come back to Firelink to assist you, although he does ask a favor first. He gives you a Blue Tearstone Ring, said to be a tear of the sorrow of the goddess Caitha. Should your path lead to the Undead Settlement, perhaps you’ll be able to grant his request. As you push through the high wall, eventually reaching the ground level, you find that signs of a great battle having taken place. Fallen swords and armor lies everywhere, indicating a battle of some sort has taken place. Armor of the Lothric Knights you’ve already seen litters the ground, swords scattered around. So too can you see an enormous blue-clad knight impaled by spears and swords, seemingly what the Lothric were fighting. Another of his kind still walks the courtyard nearby, surrounded by dozens of fallen soldiers and knights. What happened here? What force could possibly face the likes of the Lothric Knights, renown for their power to slay, as well as to tame, the dragons themselves? Even at the end of their age, the Lothric Knights must have stood as a force to be reckoned with. Where is this Holy King Lothric, the Lord of Cinder, and what keeps him away from his throne? Where you stand now, these things are all mysteries. You make your way to what would have once been the entrance to Lothric from the village far below, though the path now lies shattered, as the wall disrupted it. Pilgrims of Londor can be seen at the entrance, dead at last. These pilgrims, who were also seen in the intro cinematic, were hollows who came from the great undead land of Londor in an attempt to get as close to the first flame as possible, that they might escape the curse, and finally die. It would seem death has been granted to them at last. After fighting through more Lothric Knights, you reach the grand cathedral at the base of Lothric Castle. Inside, you are greeted by a woman clad in black. Emma, the High Priestess of Lothric, trusted by the royal family so much as be their wet nurse, gives you a banner, telling you to raise it at the cliffside, to gain passage to the land below. The watchdog she speaks of is Vordt, an Outrider Knight of the Boreal Valley. Dog truly is the word to describe Vordt, as he gives the impression of being little more than a mindless beast, ruled over by his master, the Dancer, from whom he never strays far. The Boreal Valley is a dreaded place of legend. It is said that the knights like Vordt were once men granted extraordinary power by the Pontiff Sulyvahn, but found themselves warped into mindless beasts. The Pontiff casts a large shadow over the world of Dark Souls III, as does the legendary Boreal Valley itself. You dispatch Vordt, and move forward, raising the banner high. Winged Demons, the kind that once inhabited the city of the gods long, long ago, carry you down, to the Undead Settlement below. The winged demons take you down to the Undead Settlement below. This Undead Settlement is a frightful place, as most of its residents have gone hollow. These were the people looked down upon and ignored by the people of power in Lothric. At best, they were forgotten, and left to fend for themselves, and at worst, they were actually enslaved, and set to work in Lothric proper. The same rags which these slaves were granted were also sometimes used to shame and humiliate criminals, and this is why your friend Greirat found himself wearing them. As for Greirat himself, well, he saw himself as a martyr for the poor, and sought to climb the high wall, and bring back aid for the Undead Settlement. However, he must have been caught when he finally made it up to Lothric, which is why he was imprisoned, and clad in a shameful garb. You touch down in the Settlement on the other side of the bridge which once functioned as a gateway into Lothric. Nearby, you can see the bodies of dozens of Pilgrims of Londor, who sought only to reach the land which the First Flame now inhabited, and failed. Still, they must have gotten close enough, as they now lie dead. On the other side of the destroyed bridge, leading toward Lothric, you see the corpse of a dragon, likely used to keep these poor destitute hollows, and the undead of the settlement, from entering Lothric, along with the unseen gatekeeper further up. The hollows of Londor were despised by the living. The Untrue rings describe them as “wretchedly aged, fraught with deceit, and dubiously secretive. It is no wonder that they are deeply detested,” the description muses. Should you accept his offer, he says “Ohh. I am honoured, truly. I should be dead, yet you have granted me purpose anew. I Yoel of Londor, do Solemnly swear myself to you,” and returns to Firelink Shrine. While these hollows of Londor were despised by the living, the first one you meet seems to be anything but detestable. Granting even you, an accursed undead, and unkindled failure unworthy to even be cinders, the highest levels of respect. Could Londor truly have deserved the reputation it earned as a place to be despised? Perhaps it was indeed only hated because the undead themselves were despised. Indeed, in past cycles we’ve seen many crimes of hatred take place against the undead, such as the Undead Asylum, where the living rounded up those cursed with the darksign, and left them to rot, or the Old Iron King’s Undead Purgatory, where undead were hunted for sport, and to be brutal tortured repeatedly for the sadistic glee of a corrupt king. Go back to the Firelink Shrine, and Yoel will even aid you, by drawing out your true strength (granting you additional levels at no cost). Should you choose to accept Yoel’s aid (much to his glee), you will find yourself marked by the Dark Sigil. The Dark Sigil resembles the Darksign, with which undead are branded, but the curse has filled in any gaps within it, causing it to be even darker. The Dark Sigil is a true mark of darkness, a true mark of humanity, which seeps out of it. Though the Unkindled were once Undead, they are now creatures of ash, and do not hollow naturally. With the Dark Sigil, however, they will slowly begin to succumb to the curse of undeath, becoming more and more like the hollows of Londor themselves. The more hollow you become, the more Yoel will be able to draw out your strength. Another thing of note in Firelink Shrine is that Ludleth now has a request for you. “Listen, this might pique thine interest. Before I was a Lord of Cinder, I was a student of transposition. The process of extracting, and coalescing the essence of a soul. A forbidden art, that once left a foul stain upon Courland’s honor. Tis an art that grants powers once thought unattainable. Most transposing kilns were lost with Courland, but this place is a crossing for all manner of cursed objects. If thou happen’st ‘pon a transposing kiln, bring it to me, quick.” Courland, the nation which Ludleth belonged, was known for the art of being able to turn powerful Souls into tangible items. If you can find him a transposing kiln, he’ll be able to perform this dark art for you. In a world where the dead don’t stay dead, where they just keep getting back up, branded with the darksign, you can understand how the ceremony and tradition of burying (or dissecting) the dead might take on horrific connotations. At the same time, in a world where the dead that were sent to be buried suddenly started getting back up, it isn’t hard to understand how that cemetery where they were sent might become a place for such outcasts to live together. Now, though, the pitchforks and machetes once used for the disposal of the dead are used as tools of killing. Hollows stalk the streets. Dead bodies sit in chairs, just beginning to warp into trees in the same way those on the High Wall did. There burns an enormous bonfire in a courtyard, a huge tree ablaze. Leading the hollows here are enormous women clad in holy garb, carrying with them a large tome, and an enormous mace. These are the evangelists, a holy order of women sent from the Cathedral of the Deep to preach to the citizens of the Undead Settlement, “enlightening” them, and sending them down the Road of Sacrifices. While the Undead Settlement was hardly a great place to live at the best of times, it would seem these evangelists, along with the workers who still roam, have made it a dangerous place indeed. While the evangelists seem to tolerate those who follow them, many who did not can be found strung up, impaled, burning, or otherwise mutilated. Most notably among these is Loretta, the old woman who Greirat sent you to find. You cut her body down from an overlook which it is hanging from, and find it still clutching onto the hollowed out bone she valued in life. Taking the bone to Greirat, he recognizes it immediately, marking this bone as something oddly treasured by the old woman, though to you it appears only to be a discolored human bone. I can’t claim to know who Loretta was to Greirat. A mother? A grandmother? Someone he respected? Or perhaps merely one of the poor he saw himself as the martyr for. I think it is significant to note, though, what the Blue Tearstone Ring does. “Temporarily boosts damage absorption when HP is low.” While I usually hesitate to associate gameplay mechanics with the lore of the game itself, I do think it’s interesting that this particular ring is what Greirat sought to give to Loretta. I believe, when Greirat climbed the High Wall, he sought a Blue Tearstone Ring specifically, as Loretta was a frail old woman nearing death, and Greirat hoped that the increased resilience which a Blue Tearstone Ring might provide would give her enough strength to rally. Loretta must not have actually been undead herself, as if she were, she would not have been able to die, yet you clearly find her corpse holding onto her bone. I don’t know how long Greirat was locked away in the cell in the High Wall of Lothric, but I imagine it must have been for ages (the Lothric Knight Sword description says, after all, that the height of Lothric’s power was “a long, long time ago”). Somehow, he managed to hold on to that ring though. Rotting away in a cell as even the mighty kingdom that tamed dragons fell to pieces around him. Forgotten. Still, he held onto that ring, hoping that one day he might be able to bring it to Loretta, to save her. He failed, of course, Loretta likely fell to whatever illness or frailty she had shortly after he departed. Perhaps she was even killed by one of the evangelists, useless in their eyes, too frail to make the arduous journey down the Road of Sacrifices. After all of that, Greirat himself admits he’s not surprised. That doesn’t make it hurt any less though. That doesn’t mean she doesn’t remind him of his own failings. Also to be seen in the Undead Settlement are the hollow cages, which are, as they sound, cages of hollows, seemingly fused together to be of one mind. They look far more dangerous than they actually are, luckily. As you get further into the area, you may be invaded by Holy Knight Hodrick, a mad phantom. These mad phantoms belong to the Mound Makers, a crazed covenant who see a peculiar symbol inside a particular vertebra in the human body, invading, and taking as many of these as they can, so as to make a mound of them. These vertebra form connections in their minds, each of them another member of their family. Should you manage to be picked up by one of the workers in the Undead Settlement, and dumped into their pit of hollows, you’ll find that Hodrick will actually allow you to join such a covenant, so that one day, when you go mad, you’ll be surrounded by family. As you press even deeper into the graveyard, you’ll find a small white birch tree. A giant at a nearby tower is throwing spears down below at anyone who might venture near. Near this courtyard you can find many notable items, the most noteworthy of which is the Mortician’s Ashes, once belonging to one of the gravediggers here, but now little more than dust. Give these ashes to the Shrine Handmaiden, and you’ll be able to purchase a key leading to an underground grave, but more on that later. Once you get past the giant’s spears, you find yourself in a huge structure, in the courtyard of which a group of hollows are worshipping a massive tree. Soon you discover it’s no ordinary tree, however, as it rises up and attacks you, destroying anything in its way. Another item which can be crafted by the soul of the Greatwood is the Hollowslayer Greatsword, which was “used for a lifetime by a masked knight.” Now it “harbors the fears that lurk within the mind of Hollows, and is particularly effective against them.” Players of Dark Souls II might recognize this as the Mirrah Greatsword, and know that the masked knight to which it refers was Lucatiel of Mirrah. Also of note is that you can find the Mirrah Set on a corpse nearby, implying that the nation of Mirrah was still active at the time of Lothric’s existence, and sending knights around on missions of some sort (or perhaps not, it’s hard to assert anything with the transitory nature of Lothric, as time and space begin to lose meaning). Perhaps one such knight failed to slay the Greatwood, and this is how he or she came to be dead in a tower nearby? As for Lucatiel’s Mask, that is obtainable from the trading Crow of this game, and its item description says that “A Hollow once fought valiantly with this mask, but feared the fading of herself, and implored a comrade remember her name. Perhaps that is why this gentleman’s mask is named after a woman.” This provides a nice little epilogue to Lucatiel’s story, and lets us know that, despite her own hollowing, her name is indeed still remembered many ages later. It’s a close to a happy ending as things get in the Dark Souls universe. The many curses that warped the tree caused something terrible to lurk within, an enormous fleshy arm extending from it. After you manage to harm the tree, it shakes the ground with such force that it breaks, and you fall far below, into the pit of hollows where you spoke to Holy Knight Hodrick (or not). I will say right now, there’s something about Ludleth I really don’t trust. I haven’t trusted him from the moment I laid eyes on that concept art which depicted him, and I certainly don’t trust him now. The thing of it is though, I have very little evidence which I can point to regarding way. There’s some stuff down the line, certainly, which casts suspicion upon his motives, and his past, but at the same time there’s clearly a lot of truth in the things he says. He is a Lord of Cinder, the throne does accept him, and he does help you every step of the way. Still… There’s something about him that sits wrong with me, and they way he seems to seduce the player into accept help from his forbidden art doesn’t fill me with confidence. There’s no actual downside to doing so, though, and so you gain the ability to transpose souls into powerful items, and spells. Beyond the lair of the Curse-Rotted Greatwood, there are several notable paths. First of all, nearby here you find another major NPC, Cornyx of the Great Swamp. The title is the first noteworthy thing about him, as it will be familiar to players of Dark Souls one, as the pyromancy trainer there was Laurentius of the Great Swamp. The “Great Swamp” to which that referred was the poison swamp far below Blighttown, an important location for the outcast pyromancers, as it stood at the entrance to Quelaag’s Domain, and beyond that, Lost Izalith. It is, for all intents and purposes, the birthplace of pyromancy, or as close as could be approached in Dark Souls one. In that same swamp, you could find Quelana of Izalith, one of the daughters of the Witch of Izalith, and a powerful pyromancy trainer indeed. It’s not only a direct reference to a location visited in Dark Souls one, it’s a name granting significant weight to this particular pyromancer. So this paints Cornyx as a very powerful, very wise old sage. He seems to have detailed knowledge of the events of the first game, or at least of the legends they’ve warped into. He is also tired, and worn out, before he sees the Unkindled One as a final pupil. Beyond Cornyx, one can find an old underground grave, locked up tight. Taking the key sold by the Shrine Handmaiden there will grant you access. The first thing you find within this underground gravesite is a statue of Velka, the goddess of sin. Here you can request absolution for your sins. Remember the placement of this statue for now, I do think it’s interesting to note, especially in regard to the next area we’ll be talking about. For now, though, you press onward. It would seem the dead in this crypt don’t particularly want to stay dead either, as skeletons begin to reform and rise as you go through it. Some of these skeletons, interestingly enough, look overgrown with roots themselves, as bizarre as that may be. Perhaps the roots of the Curse-Rotted Greatwood spread further than we realized, or else these skeletons are warping in the same way the hollows seen scattered around did. You hold your hand out, and touch her. “Ahh, yes, there you are, so close indeed. Then I am not entirely alone, just yet. Praise the merciful gods above… Oh, forgive me. I am Irina of Carim. Irina is your miracle vendor for Dark Souls III, and she’s more than happy to enter into your service at Firelink should you allow it. As a failed Fire Keeper, she is blind, but the Way of the White had a tradition of placing faith in the blind, so braille tomes were not uncommon. How was it that a blind woman found herself trapped in such a dark cage? Well, we need look no further than her “guardian” and jailer, who sits just outside. Eygon of Carim serves as Irina’s protector. Carim knights can spend their entire careers protecting a single maiden, and Eygon would seemingly do anything to keep Irina safe. Upon talking to Eygon for the first time, you’ll notice he takes an immediate disliking to you. While he may be there to protect Irina, he doesn’t seem to have much fondness for her, either. While Eygon’s armor doesn’t shed much light on him personally, one item which does actually give us some (rather bizarre) information about him is his shield. The Moaning Shield’s description says that it is decorated with the face of his sister, who is several years his elder. If you’ll allow me to go off on a tangent for a moment, there is quite a bit of information about Morne. We learn from item descriptions that he served a single goddess, that this goddess was specifically Caitha, and that he worked with Caitha (or perhaps the Archbishop? The phrasing on the ring is vague) to provide comfort to the suffering. Caitha was a goddess first mentioned in Dark Souls II, who has now been actually placed as being a goddess of Carim, despite Carim never being referenced in Dark Souls II. Described as the goddess of tears in Dark Souls II, the only items directly connected to her were the two tearstone rings, and “Caitha’s Chime,” all three of which are still present in Dark Souls II. The descriptions of the Tearstone rings, which we saw earlier when Greirat gave the blue one to us, aren’t particularly interesting. They merely state that the stones are said to be tears of Caitha, and that tears are always more beautiful near death. What is interesting is that in Dark Souls II, the Chime said that “some believe that [Caitha] is a demoness that guides us toward misfortune.” This reference is gone in Dark Souls III, where the description instead tells us that it is “Rare even amongst Carim clerics. Affected by intelligence, a rare thing for miracle catalysts, and also agreeable with miracles that lean towards the Dark. Its existence is concealed in the name of the Archbishop, as it is anathema.” One definition for “anathema,” by the way, is “a formal ecclesiastical curse involving excommunication.” Considering that it is considered anathema by the Archbishop, I think it’s safe to say Caitha is perhaps not in as good of graces with the Way of the White. The last piece of information I can find about Morne is on the description of his greathammer, which says that it is “imbued with the twisted rage of Apostle Morne.” “Twisted rage” is not something normally associated with devout holy men. The story of Morne and Caitha, one of those things that is never directly referenced, or even alluded to in the game proper, reminds me very heavily of Maiden Astrea and Garl Vinland from Demon’s Souls. While it’s not prominent enough for me to call it an outright reference (like some things in the game most definitely are), there’s certainly a lot of resonance between the two stories, right down to comparing Caitha to the “maidens” which the Carim Knights protect. If it was indeed Caitha and Morne who brought comfort to the suffering, that’s the exact same purpose Maiden Astrea and Garl Vinland had in the Valley of Defilement. Caitha was rumored to be a powerful demoness, and Maiden Astrea explicitly was one, whether she was truly evil or not. If you’re not familiar with the story of Maiden Astrea and Garl Vinland, I highly recommend going to check out a lore video on the two, it’s some of the better storytelling in Demon’s Souls (which unfortunately remains my overall least favorite game in the Soulsborne series). Luckily for the both of you, you happened to enter just in time to have the solution to this problem revealed to you. Using your head, you send the first elevator down, and ride the second one back up. At the top of the tower you finally meet the giant who was tossing spears down below, seemingly in an effort to protect the young birch tree below. The giant is a simple, but gentle soul, and will gladly make peace with you, promising to help when he can. I find it very curious that they chose not to simply name this character Siegmeyer, as he is for all intents and purposes identical to Siegmeyer in every way. From voice acting, to mannerisms, to role in the story, Siegward and Siegmeyer are essentially identical. It even gives Siegmeyer a decent character arc, as at the end of his questline in the first game he would easily be killed by charging in too early, but now you are the one who charges into battle too soon, and he is the one who rescues you. It’s a charming exchange, and his quest chain is by far my favorite of those in Dark Souls III, for reasons that will become apparent by the end. In any case, standing victorious over the mighty demon, you are finally ready to go down below that abandoned church, and see what horrors await you on the Road of Sacrifices.